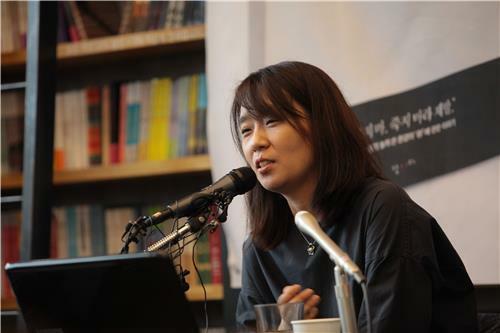 South Korean novelist Han Kang, the 2016 winner of the Man Booker International Prize, has been shortlisted for the British literary award of world authority, the organizer said Thursday (British local time). Han's "The White Book" is among the six finalists for the 2018 Man Booker prize. The 2015 winner, Laszlo Krasznahorkai from Hungary, also made the list. "The White Book" was translated by Deborah Smith, who was a joint recipient, along with Han, of the Man Booker award two years ago for her translation of "The Vegetarian." First published in May 2016 in South Korea, "The White Book" is a collection of 65 short writings featuring the author's meditations on white objects. Its English translation was published by Britain's Portobello Books in November and has since received favorable reviews from news media, publishers and readers. When the book was published in Korea, the author said the book expressed the strong resilience of human beings amid lifelong suffering. "I wrote the book thinking about a baby sister who died before I was born," Han said, "I wanted to give it a new life, something dazzling and transparent." Han started writing the book in the winter of 2013. The first draft came out in 2014, and the final version was finally completed in the spring of 2016 after rigorous editing and rewriting. "The book can be read as a poem or a novel. It took me so long to complete it because the form is a bit strange," the author said. The novel is "not an easy read. It will make readers take their time in absorbing the content, having them grab a pencil to underline some words or sentences and making them go back to a certain page," the Korean publisher Nanda wrote in a book review. The white color, Han said, represents life and death in the Korean cultural context in which white is the color of the clothes of a newborn baby and also of a dead person. In the section "Best Books of 2017" in The Guardian newspaper, British novelist Jon McGregor reviewed the book as being "delicate and thoughtful and concise and dense and strong; this is the kind of writing I like to read slowly." The final author-translator team will be announced on May 22.